The University of Iowa Center for Advancement helps UI friends and alumni stay connected, get involved, and give back. Get involved and join the UI community. Choose from a variety of programs, events, and groups—on campus and off—to fit your UI experience. Your gift to the University of Iowa makes a difference. By giving to your Iowa passion, you help change the lives of our students, our community, and the world. Read stories of Hawkeyes making a difference in Iowa and around the world. A new student commons will be named after the late Rita Frantz and her husband, David. Photo: Joni Tyrrell David Frantz (center) reviews renovation plans with architect Tom Feldmann, of BNIM, and Dayna Ballantine, director of development for the UI College of Nursing, during a tour of the new Dr. Rita and David Frantz Student Commons in the College of Nursing Building. Rita Frantz (73MA, 78PhD) was a tireless promoter of her profession—even at the end of her life. Though the former University of Iowa College of Nursing dean was battling ovarian cancer, she continued to work from home during her treatments, finally resigning her position on Sept. 6, 2016, just one day before her death. To memorialize his wife’s deep commitment to her craft—and her college—Rita’s husband, David, has continued their tradition of giving back to the place she loved so much. His most recent gift of $500,000 will create the Dr. Rita and David Frantz Student Commons in the College of Nursing Building. 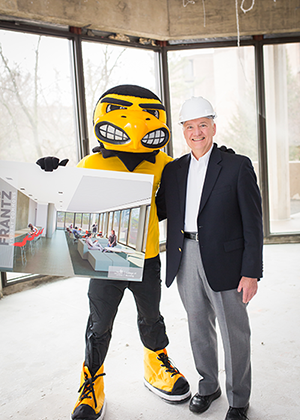 Photo: Joni Tyrrell David Frantz and Herky pose with an architect’s rendering of the new commons. This is the first leadership gift in the college’s campaign to raise $2 million in private support to renovate the College of Nursing Building. In addition to the centralized student commons—which will feature collaboration rooms, individual study areas, and meeting spaces—the $10 million project will create new classroom and student spaces in the building, which opened in 1971 and has never been renovated. These updates are scheduled for completion in 2019. Although the university enacted a five-month moratorium on campus projects in April to address state funding cuts, building efforts like this one currently in the construction phase are continuing. Rita Frantz grew up on a farm near Davenport and earned her bachelor’s degree in nursing from Marycrest College. She received a master’s degree in medical-surgical nursing from the UI in 1972 and immediately joined the faculty in the UI College of Nursing. She went on to complete a doctoral degree in educational psychology in 1977 and quickly rose through the college’s ranks. She was internationally known for her research in pressure ulcers and became the holder of Kelting Deanship, an endowed position created in memory of John C. and Catherine Meeder Kelting, in 2007. During her time as dean, Rita was focused on keeping the college at the forefront of innovation. She also served as leader of the Iowa Action Coalition, which implemented the recommendations of the Institute of Medicine’s report on nursing. Shortly after her death, David made a gift of $5.25 million to fund two endowed chairs and a professorship in the college, in tribute to her work on behalf of the college and its faculty. Get the latest news and information for alumni, fans, and friends of the University of Iowa. Explore the Spring 2019 edition of the Iowa Magazine. NOTICE: The University of Iowa Center for Advancement is an operational name for the State University of Iowa Foundation, an independent, Iowa nonprofit corporation organized as a 501(c)(3) tax-exempt, publicly supported charitable entity working to advance the University of Iowa. Please review its full disclosure statement.